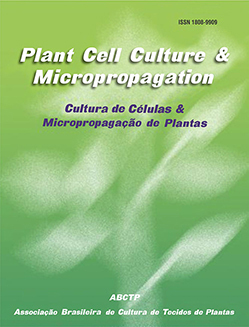 Plant Cell Culture & Micropropagation is a jounal that publishes scientific papers in the area of plant tissue culture. Submitted manuscripts must be written in English, be original, and be in accordance with the journal's standards and not be submitted for publication elsewhere. Its content (data, ideas, opinions and concepts) is the sole responsibility of the author(s). PREZADOS USUÁRIOS AO SE CADASTRAREM NO SISTEMA VERIFIQUEM SE TODOS OS DADOS FORAM PREENCHIDOS E NA OPÇÃO URL ADICIONEM O LINK PARA O CURRÍCULO LATTES. É IMPORTANTE QUE TANTO OS AUTORES COMO OS CO-AUTORES SE CADASTREM NO SISTEMA NO MOMENTO DA SUBMISSÃO DE ARTIGOS.